You can use an inversion table to improve your body’s core strength by performing sit-ups. Firstly, lie on the inversion table and then place your hands behind your head and then sit up (if you can hit your knees with your head, the better). Hold this position for several seconds and then slowly lower your body. If you find it hard to repeat this motion, place your hands behind your knees and try to pull yourself up. Alternatively, perform half sit-ups instead of full sit-ups. Perform five to eight repetitions and then rest. You can also do inverted crunches on an inversion table. Just like sit-ups, inverted crunches target the abdominal area. Inverted crunches are more difficult than traditional crunches because you have to raise your legs much higher, which means your body has to work against gravitational forces. You can increase or reduce the difficulty of inverted crunches by changing the incline angle of your inversion table. To perform this exercise, lie on an inversion table and tilt it to an upside-down position. Place your hands on the back of your head and try to lift your body upwards as much as you can. Hold this position for about 10 seconds and then lower your upper body down slowly. If you can, perform about eight repetitions. Most people are likely familiar with traditional squats, which a person performs while standing. 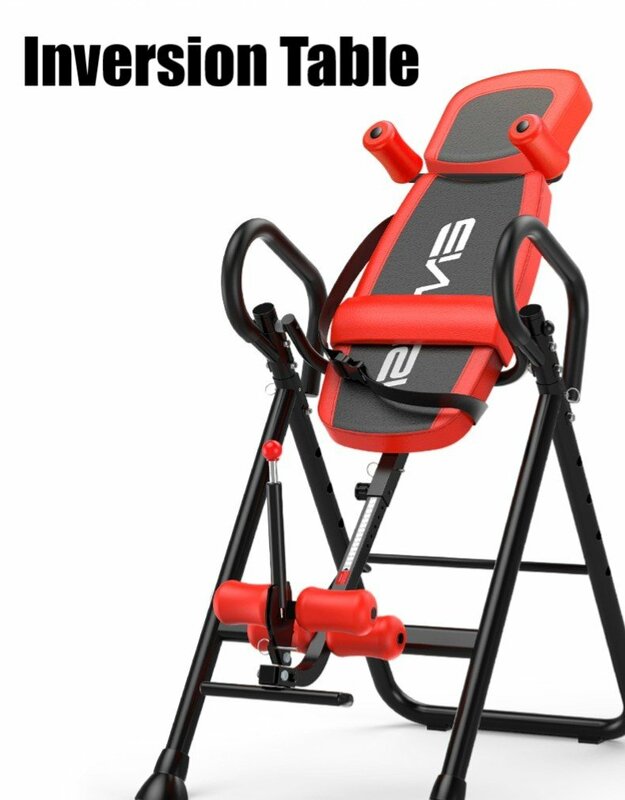 However, with an inversion table, you would be able to do inverted squats. This is a great exercise that targets that the legs. Lie down on your inversion table and tilt it to an upside-down position. Place your hands on the frame of your inversion table, bend your knees, and start lifting your whole body upwards. Make sure you use your glutes and hamstrings to pull yourself up. This exercise is similar to a standing squat. Depending on your fitness level, you can perform anywhere from 5-12 repetitions. You can use an inversion table to perform a full body stretch. However, it is probably important to note that there is no standard body stretching exercise. A simple body stretch that you can perform on an inversion table entails lying on the table upside down and extending your arms and upper body as much as you can. This stretches the spine. You could also twist your body from side to side, raise your body and touch the knees, as well as arching your back. Try to hold each body stretch position for about two minutes or so. You can include weight training in your list of inversion table exercises. Here, you would need to use weights such as dumbbells to perform exercises while strapped to an inversion table. Nevertheless, it is not advisable for novices to perform these exercises because they can be difficult and challenging. Here, you should start with a light weight to allow your body to become accustomed to lifting weights in inverted positions. Over time, you can graduate to heavier weights. In conclusion, you can use an inversion table to perform a wide range of exercises. Some of the popular inversion table exercises and stretches include full body stretches, inverted squats, inverted crunches, sit-ups, and even lifting weights. Working out regularly will help you lose weight and prevent development of heart diseases. If you do not exercise regularly, start with partial inversion exercises to avoid developing injuries. Credit Card Payment Pay using your PayPal account. You will be redirected to the PayPal system to complete the payment.